Here we are in the beautiful month of May. The buds haven’t quite burst open yet, but plenty of birds are singing, and Schumann probably didn’t have the first of the month in mind when he wrote his song cycle anyway. The weather is only sluggishly warming up, the continuing cool temperatures perhaps the lingering effects of the March breakup of the polar vortex that left arctic air sitting over so much of eastern North America. Despite this, the transition to the breeding season is becoming more and more apparent every day. No Golden-crowned Kinglets have been recorded since April 23rd, Junco sightings have become few and far between, and the diminutive Winter Wrens have been replaced by House Wrens. 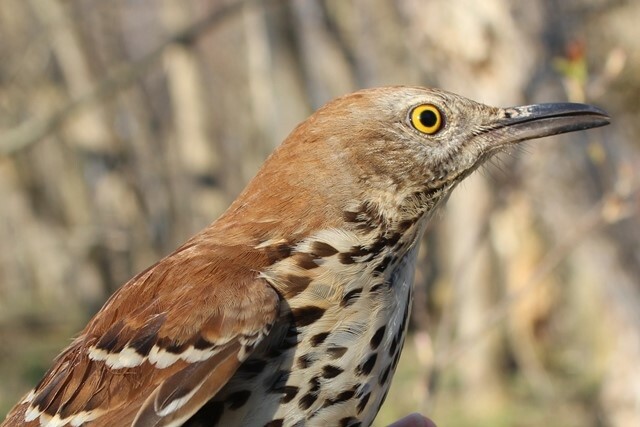 Brown Thrashers are singing and nesting is already in full swing amongst resident birds like American Robin and Black-capped Chickadee. Winds have remained predominantly from the north and east, so we have yet to experience a really strong push of migrants. New species have been trickling in fairly steadily nonetheless, with at least one new migrant species being recorded every day except the 24th and 29th. A storm front moved through on the night of April 24/25 and the three succeeding days were some of the busiest at the nets thus far. Seasonal firsts on these days were: Black-throated Green Warbler, Western Palm Warbler, and Northern Waterthrush on the 25th; Great-crested Flycatcher, Nashville Warbler, and Common Yellowthroat on the 26th; and Red-headed Woodpecker, Yellow-throated Vireo, Northern Rough-winged Swallow, and Cliff Swallow on the 27th. Lots of insects have been emerging which will help sustain the northward push of the insect specialists, everything from clouds of midges on the beach, to Red Admiral and Spring Azure butterflies in the woods. And speaking of insectivorous birds, as the new arrivals list probably indicated, the wood warbler migration is really starting to get in gear with nine species having been recorded since the start of the month, seven of which arrived in the last ten days. The two newer species not mentioned above were Yellow Warbler and Black-and-white Warbler. Pine and Yellow-rumped Warblers were sighted earlier in April, but the latter were really on the move this past week, with a peak count of 96 birds on the 27th, when they were fairly dripping off the bushes lining Fish Point’s west beach. They probably still account for half of the individual wood warblers on Fish Point as of this writing. Also profiting from the bug banquet were the swallows. All six of the swallow species that regularly breed in Ontario have now been seen at Fish Point this season. Bank, Cliff, and Rough-winged Swallows are only present in small numbers, but daily Barn Swallow counts have increased from two or three, to 20 or more since April 27th. Purple Martin houses are filling up all over the island. Total species counts were in the range of 41-45 from the 21st to the 25th, then increased following the passage of the aforementioned storm front, peaking at 58 species on the 27th. Only 38 species were tallied on the 28th, but that was partly due to rainy conditions limiting our observation period to the daily census. Next summary in ten days time.